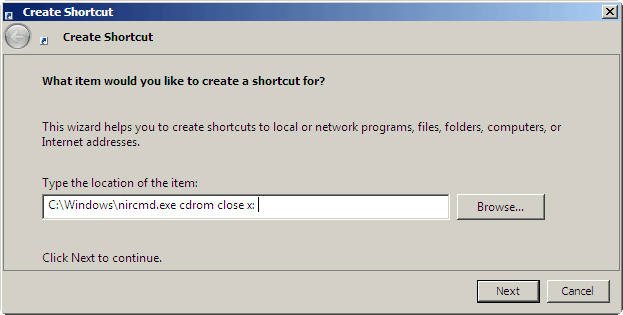 We can only eject the CD/DVD Tray from the Windows Explorer, but it can be very convenient having a shortcut on the desktop with an option of opening and closing the CD/DVD tray. I’ll show a simple way of doing this using NirCmd, which is command-line utility that allows you to do some useful tasks without the need of a GUI. 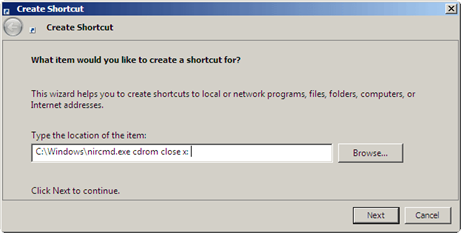 Browse and locate the path in windows folder for NirCmd, leave a space and cdrom open x: (where x denotes drive letter). Click next and save the shortcut with Open CD Tray. Nice to see my tute in here …. Thanks for spreading it. hay….. its too good n helpful to me. thanks dude.